It was a busy week for royal speeches as the Queen gave her sixth speech to the combined Houses of Parliament and the Duchess of Cambridge gave her first public speech at a children’s hospice in Ipswich. They are at different stages of their Royal careers. Elizabeth is the reigning monarch and Catherine is next but one in line as Queen. Different generations. So, their speeches this week reflected that generational difference. The Queen’s speech in Westminster Hall marked the occasion of her Diamond Jubilee. With an audience of Members of Parliament (MPs) and peers from both Houses of Parliament her speech praised the British virtues of ingenuity, resilience and tolerance. And her speech also celebrated the Duke of Edinburgh, her “constant strength and guide” over the years. This was her sixth speech to the two Houses of Parliament. That’s no small feat for a monarch who has outlasted 12 Prime Ministers. Note, of course, that the Queen’s Speech to Parliament, at State Opening, is a separate event altogether. So, yes, there are even more Royal speeches we could count. I have been privileged to witness some of that history and, with the support of my family, rededicate myself to the service of our great country and its people now and in the years to come. Catherine’s speech was certainly more modest in setting and tone. But, it was no less important a landmark. Her speech at the Treetops children’s hospice was her first speech as Duchess of Cambridge since her wedding last year. The achievement of this landmark has, no doubt, been accelerated by Prince William’s absence in the Falkland Islands. She began her speech and was decidedly nervous. So, she read from notes with the lectern right in front. But she did well. She spoke with a good tone, pace and importantly, with conviction.. And that’s important. Because, it’s the interest, passion and conviction that goes into royal speeches that make them special. The Queen has mastered this over her 60-year reign. And Catherine’s first speech suggests that she’s well-placed to continue this tradition for royal speeches. 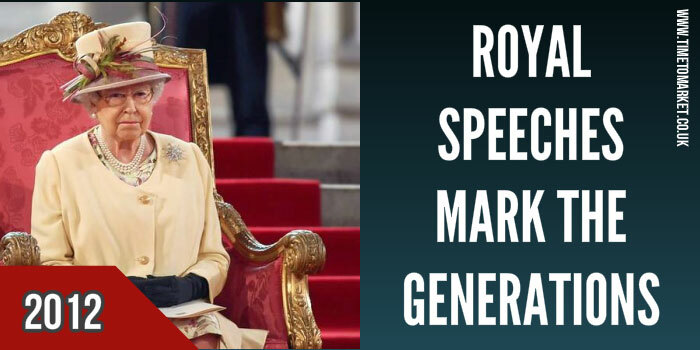 If you have to give your first speech and want a right royal performance then why not plan a public speaking coaching session. Boost your skills and confidence with this one day one-to-one coaching session at your own office or a nearby training centre. Please don’t hesitate to get in touch.